It's always a challenge to come up with hand-knitted gifts for my kids. How many mittens, hats and scarves does a child need? Too many and they get cavalier, leaving them at the ice rink, on the playground, and in various friends' cars, homes, and yards. Both of my kids, despite the ten years between them, are huge fans of the Moomintroll books, a series about a family of hippo-like trolls and their acquaintances written by Finnish author Tove Janssen. They were particular favorites of mine as a child and I was delighted to find them still in print when my oldest was embarking on chapter books. He thrilled us by revisiting them with his little sister over the past summer, taking a turn in the bedtime reading rotation. Some sultry afternoons I would spot the two of them in the hammock, the sound of my son's voice drifting over the birds and the drone of traffic. It turns out that in Finland, where these adorable creatures were first imagined, the Moomins enjoy a celebrity to rival Mickey Mouse here. You can buy fabric, dinnerware, figurines, and playhouses. There is an amusement park with a Moomin House. My son was hugely disappointed that I discovered this after he was done playing with figurines, but he was a big supporter of the MiMBY Girl benefitting from the discovery. The problem is the cost of purchasing and shipping these goodies. Everything can be had via the internet if you are willing to pay. While the figurines were fairly affordable, their adorable home was not. Here the magic of knitting stepped in. 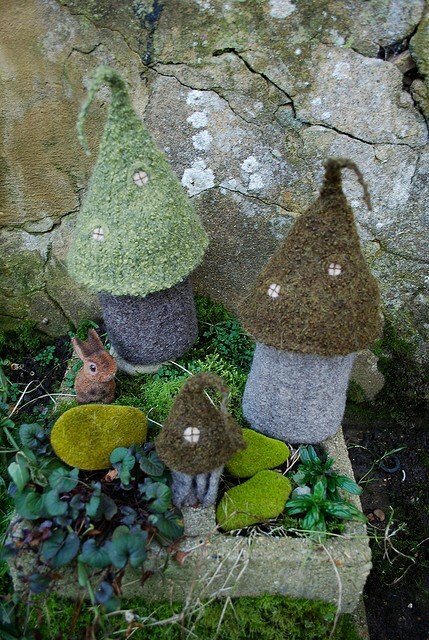 A singer in London designs knitted objects - her website is Tiny Owl Knits. She designed a little house to store her needles and crochet hooks (photo below is from her website). 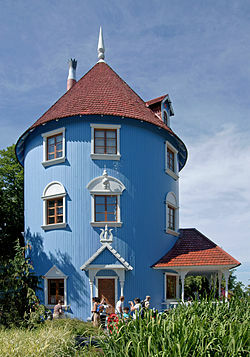 It happens to look a lot like a Moomin House. Problem solved. With the magic of the internet and a sizable stash of yarn at hand, I was able to embark quickly on this project, felting this morning (Christmas Eve), and with a plan for a sub-structure of 4" PVC pipe sliced lengthwise in half and hinged to create the structure for the little house. I think it's even better than what we could have bought. I'll post finished pictures for other diehard Moomin fans.